1 of 1 Heat oven to 350 degrees F. Grease three 9-inch round layer-cake pans. Dust the pans with flour, tapping out the excess flour. 1 of 3 Beat the butter in a large bowl until creamy. Gradually add sugar, beating thoroughly, until light and fluffy. Add the eggs, one at a time, beating well after each addition. 2 of 3 Combine the flour and baking powder in a small bowl. Add to batter, alternating with the milk, beginning and ending with flour, beating thoroughly after each addition. Beat in vanilla. Divide batter equally among the three prepared cake pans. 3 of 3 Bake cakes in the 350 degree F oven for 25 minutes or until a wooden pick inserted in the centers of the cakes comes out clean. Cool the cakes completely in the pans on wire racks. 1 of 2 Combine the egg whites, sugar, salt, water and corn syrup in a heavy saucepan. Heat over very low heat, beating constantly with a hand mixer and scraping down the side of the pan to prevent sugar crystals from forming, until soft peaks form about 7 minutes total. Remove the saucepan from the heat. Add the vanilla and lemon extract; beat for 1 minute. 2 of 2 Turn the cakes out of the pans. Place one layer on a serving plate; slide thin strips of parchment or waxed paper underneath the layer to keep the plate clean. 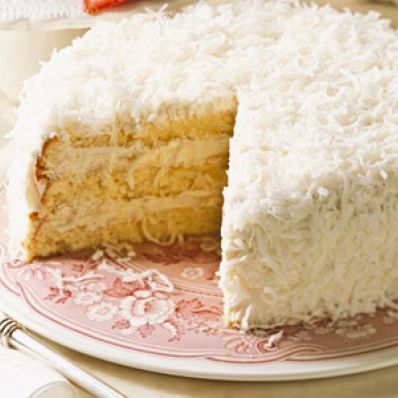 Spread a small amount of frosting over the top of the cake and sprinkle with a little of the shredded coconut. Stack second layer on top; frost and sprinkle with coconut. Top with third layer. Frost the top and sides of the cake. Sprinkle the remaining coconut over the sides and top. Remove paper strips. Makes 12 servings.